Athens, GA (Feb 27, 2008) - University of Georgia (UGA) Football Coach Mark Richt held his pre-Spring Practice press conference tonight. Eye on Sports Media had a chance to talk to University of Georgia Quarterback Matthew Stafford after the formal part of the presser. 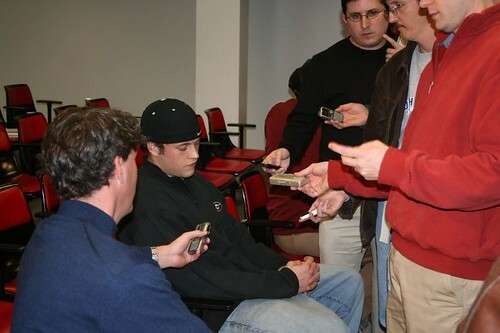 UGA Quarterback Matthew Stafford takes questions from print reporters at Stegeman Coliseum. Photograph Copyright 2008 by Christopher Byrne/Eye on Sports Media. The subject was the now famous photograph of Stafford hoisting an empty keg of beer over his head at Talladega SuperSpeedway last spring. This photograph flew around the internet in a flash and the interpretation was that Stafford had been illegally drinking. The now infamous photograph of Matthew Stafford hoisting the keg. EOSM: So what have you learned from the photograph incident? Stafford: That you have to be real careful what you do in public because you never know where pictures of it will end up. EOSM: Is that what you advise your friends? EOSM: So do you have a MySpace or Facebook page? EOSM: Is that because of the risks associated with them and what happened with that picture? So there you have it. Stafford learned a lesson the hard way, and at a young age. Being in the public eye as an athlete or television personality puts the spotlight on you, and there is no escaping leaked photographs or videotapes.